As the days get shorter and the temperatures start their downward spiral, we are preparing the homestead for winter. Most of these preparations center around our flock. Last year, we decided to carry only 6 birds over the winter. 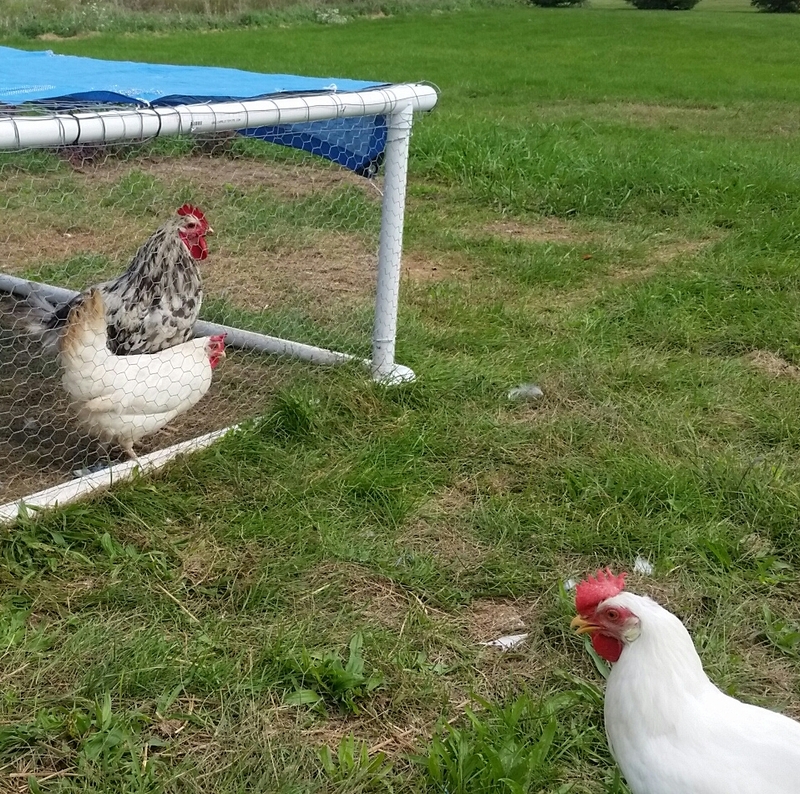 It seemed to work out and we averaged 4-5 eggs a day. Enough for us to eat and share with our family. This year I’m not sure what we will do. In the meantime, we’ve made a few changes to the living arrangements. 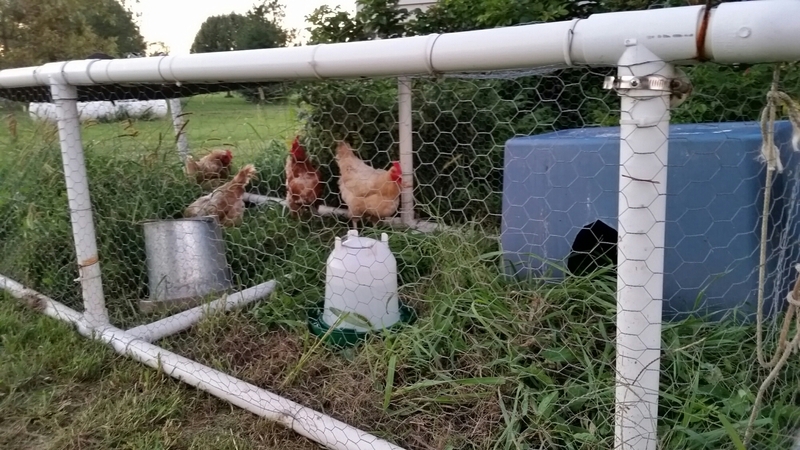 The leghorns and Pecky are all hooked up the chicken tractor. That’s right, the old gals got the boot. At first, they were intimidated by their new condo. They needed a bit of encouragement to walk up the ramp, but once they figured it out they were quite happy with their new digs. The older gals were demoted to a small apartment in the form of an upside down blue tote with a hole for a door. 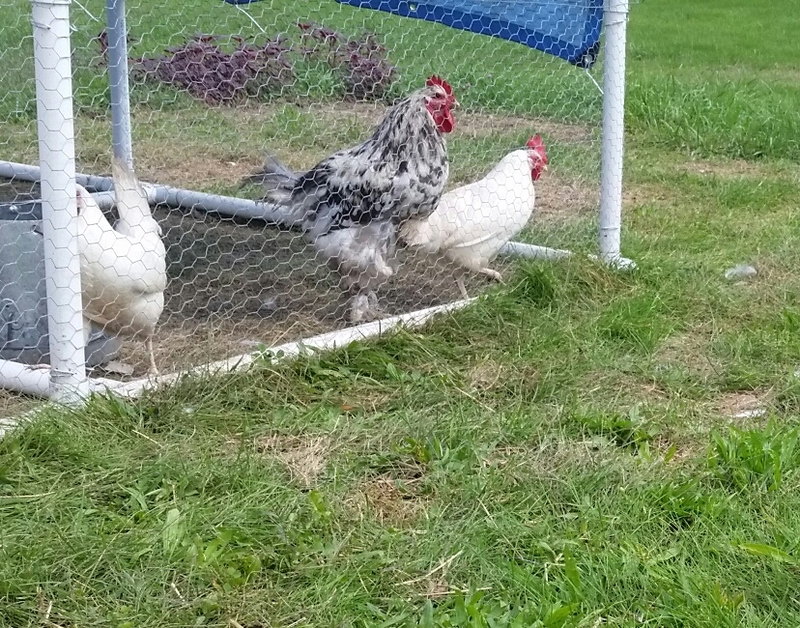 They still have plenty of room in their pen, but they are definitely not happy, and they have no problem voicing their discontent…loudly and frequently. And Blue. Poor, poor Blue. She wants so badly to be a part of a flock. She’s tried jumping in with the leghorns several times…almost daily in fact. But they just don’t want her. After hooking the leghorns up to the coop, she took to roosting on top of the ramp, hoping to be let in. They all just strutted past her, not even acknowledging her presence. So, we took the little tote that they had been using prior to their move and made her a shelter. 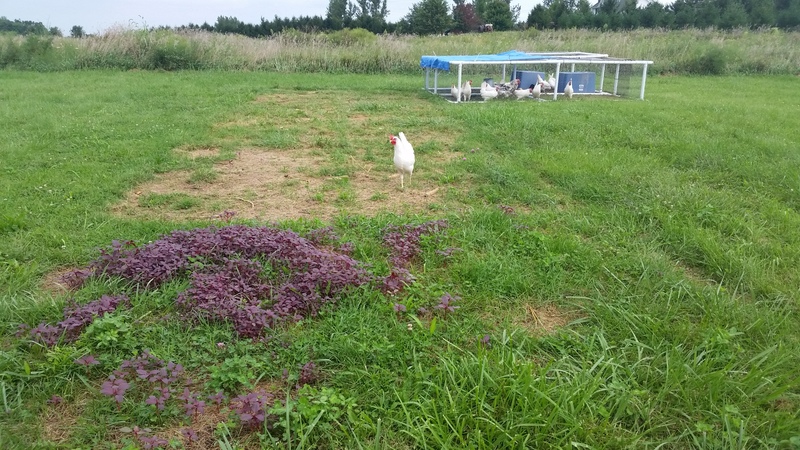 Since she normally roosts right on top of the big pen, we put her studio apartment right next to the mean bullies who won’t let her rejoin their ranks. Who needs ’em I say. Blue has the run of the place and can eat all the bugs, worms and scraps she wants. She has full reign in the garden beds and can munch on marigolds or amaranth whenever she wishes. Initially, I thought Pecky would be my favorite. But, while I still think he’s a beautiful bird, I’m more partial to our underdog. She’s become more used to us, even letting me pick her up without protest…occasionally. 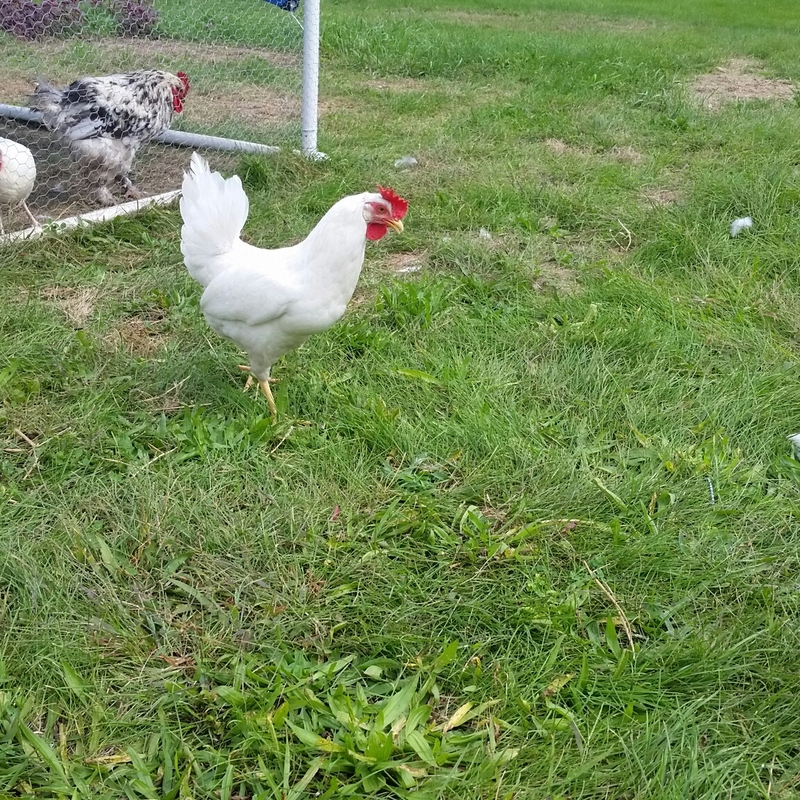 I know there is a big clutch of eggs somewhere on the homestead as we’ve yet to find her new nest, but even that minor annoyance does not lessen my attachment to her. She’s pecked her way into my heart. Lol! I just really wish I could find where she is laying her eggs!